First, let me apologize for not having posted earlier in the month as the news was breaking in regards to Lexington and the 2018 Games. In reality its been a busy couple of months and I knew I would need some time to put my thoughts together in a coherent way. Obviously I was disappointed(again) when the news came out that Kentucky would be passing on making another bid for the 2018 Games. In some ways I can’t blame that State, we made a legitimate bid last year when things initially fell through for Bromont and the FEI still went back and gave the Games to Bromont anyway. Yes, the clean venue clause that Longines has with FEI was the reason given for us not getting the Games and on face value that was a hurdle and everyone just excepted that, but in reality I think if the FEI had wanted to clear that hurdle it could of been cleared, certainly the FEI knew of that hurdle before Lexington made its bid, so why even have Lexington make the bid in that case. Ultimately I do not know the answers to that and even though I have my theories, to speculate on that in a public forum doesn’t serve any good purpose and my ultimately goal remains the success of the Games overall as well as their return to Kentucky. Now some of my disappointment is self inflicted in that I believe you have to keep a positive attitude about things if you want them to succeed. Sometimes I am accused of being overly positive, which is funny because I fancy myself a very logical person who prides himself on being able to look at a scenario from all sides. So in reality I was disappointed but not surprised because there is a lot of competing things going on in the Commonwealth and for the powers that be, there probably isn’t an upside for them to us hosting the Games, certainly not as much upside as potential downside for them. All of what I have just written is the past now, I have had an excellent summer even with the disappointment of us not getting WEG for 2018 which when you think about it means my life is pretty great and I am very blessed so I continue to move forward with the purpose to improve the lives of those around me and of this great Commonwealth. Now what I did find to be a happy surprise was the announcement of the bid by the Tryon International Equestrian Center in Mill Spring, North Carolina to host the 2018 Games. The Tryon International Equestrian Center is a very new facility that only first opened the summer before the last Games occurred in Normandy and apparently there is some chatter that the developers plans were to bid for the 2022 Games which makes really good sense. Here is the Google Maps view of the Center , if you compare it to the Kentucky Horse Park it looks about half the overall size but its actually listed at 1,500 acres compared to the Horse Park’s 1224 acres. Of course a large portion of the Tryon acreage is wooded, almost like somebody was trying to hide the fact that they were building a world class Equestrian Park, I am only half joking as it would seem they didn’t want to get the word until the had the park completed though they have been hosting events there, almost as test runs as they build out the rest of the park. Now I do not know Mark Bellissimo who heads up the Tryon Equestrian Partners, but I will say at this point my hat is off to them for this endeavor and not only do I wish them much success, I will support them anyway I can. There is something about the outside of a horse that is good for the inside of a man! I will be back sooner then later with more on the Tryon Center, our plans of support and the other potential contenders for the 2018 Games. Rolex Repeat and all things Spring? Michael Jung of Germany repeated in 2016 winning the Rolex Grand Slam Events and I had the good fortune of tail-gating at the Rolex Kentucky 3-Day Event to watch him. In other news Adelaide, South Australia has given interest in hosting the 2022 FEI World Equestrian Games which would be another first for the Games. I didn’t make it to Sydney for the 200o Summer Olympics so I would certainly have to put it on my bucket list to go if they were successful, with that said of course I am still hopeful that we will submit a winning bid for the 2022 Games. On a personal note, our horses are showing well and warm weather has finally arrived so Spring has been good on many levels. Of course we have to take the bad with the good and a number of things have occurred in the last several months that I feel must be addressed because they are part of the horse world. I guess the first to address is a number of deaths of Eventers that has been reported this spring. Ultimately Eventing is a dangerous sport and that is something anyone competing in it knows but it doesn’t make any of us feel any better when we hear about the death or injury of someone enjoying something we enjoy as well. First I want to say to the families that have lost someone you have my deepest sympathies and even though we all will say they were doing something they loved it doesn’t make it any easier for those left behind. On another somewhat dubious note, Bromont is having a number of issues related to hosting the 2018, Horse Canada just had an extensive article on it that you can read here . Some may think I would be happy that Bromont was having issues, in no way do I consider Bromont’s issues a good thing for Kentucky because it is certainly not a good thing for WEG. Remember there was a time before the World Equestrian Games, it was called the 80’s so I maybe more then others is acutely aware that WEG could vanish again. There has been much talk even before Kentucky hosted the Games about going back to just having the European Championships. So to say this Spring has been turbulent like a Spring Thunderstorm in Kentucky might be stating it mildly. So here is hoping that June brings a more sunny outlook on the horse world. FEI has opened the bidding process for the 2022 World Equestrian Games, this is not an April Fools Joke. Currently only the Expression of Interest Form is available to download with the Bid Application and Questionnaire becoming available in May. August is the deadline to return the Bid Applications for consideration with the announcement of candidates in December. At this time I have no specific information on where Kentucky is in planning to make a bid. I know after our losing our bid for the 2018 Games it was indicated that we would bid for the 2022 Games and with the contract with Rolex for advertising rights at the Kentucky Horse Park expiring in 2018 we would be free to pursue them without the issue that prevented us from getting the 2018 Games, that being the contract Longines has with the FEI that stipulates clean venues for any events they sponsor, the World Equestrian Games being one of those. I am certainly going to let my voice be heard in that I believe this is an important economic event for Kentucky to pursue. As I find out things that I am at liberty to share I will, though I suspect early in the go any information that I do receive will be under nondisclosure requirements or will be hear say that would not benefit the process to release anyway. So I ask everyone to be understanding if you think I am withholding anything and also I ask that you let your voice be heard by your elected representatives that you feel this is something important for Kentucky to pursue. Kentucky Three-Day Event Presented by Land Rover, will host its second annual Maker’s Mark Commemorative Bottle Fundraising Auction and Reception on Thursday, April 28, at 7:00 p.m. All proceeds from the auction, held at Lexington landmark The Livery, will benefit the Thoroughbred Aftercare Alliance, the official charity of the 2016 Rolex Kentucky. The Rolex Kentucky returns to the Kentucky Horse Park in Lexington, Ky., April 28-May 1. A limited number of Maker’s Mark commemorative bottles, featuring 2015 event winner, Michael Jung riding Fischerrocana FST, will be auctioned off. Tickets to this fundraising event are $200 per individual or $300 per couple. A voucher worth $100 will be included with each individual or couple ticket purchased. That voucher can be used during the bottle auction. There is a limit of one bottle per ticket. 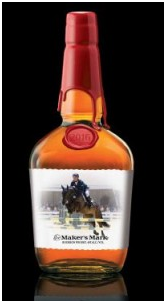 Tickets can be purchased until April 18 at www.rk3de.org/bottle-fundraiser. The Thoroughbred Aftercare Alliance is a Lexington-based, non-profit organization that accredits, inspects and awards grants to approved aftercare organizations to retire, retrain and rehome Thoroughbreds using industry-wide funding. The TAA supports 501(c)(3) charitable organizations across the country that retire, retrain and re-home Thoroughbreds. TAA has awarded more than $3.4 million to accredited organizations in the past two years and currently supports 56 accredited organizations across 180 facilities in the United States. Retired racehorses from TAA-accredited organizations are re-homed every day and are retrained to be successful in Show Jumping, Dressage, Eventing, Combined Driving, Endurance and Polo, as well as Western disciplines, affording each of them the opportunity to have a second career. The Thursday night bottle auction is just one of several fund-raising activities happening during the Rolex Kentucky, the “Best Weekend All Year,” The RK-5K, the Twilight Run at the Rolex Kentucky, is a run/walk on Friday evening (April 29); 5K participants have an opportunity to contribute to TAA. And five-time Grammy Nominee Hunter Hayes will be performing Saturday evening (April 30) at the Alltech Arena on the Kentucky Horse Park grounds after the Cross-Country phase of the Rolex Kentucky. A portion of the proceeds from the concert will benefit the U.S. Equestrian Team Foundation and TAA. Volunteers from TAA will also be manning the bag-check booth throughout the event as a fund-raiser for their organization. A 2016 Olympic trial, the Rolex Kentucky Three-Day Event is one of the most prestigious equestrian competitions in the world. The Fédération Equestre Internationale (International Equestrian Federation – FEI), the world’s governing body of equestrian sports, has designated the Rolex Kentucky Three–Day Event as a “Four Star” eventing competition, the sport’s highest designation, which is given only to the Olympic Games, World Championships, and six annual events around the world. Rolex Kentucky hosts many of the world’s best horses and riders each year as they compete for their share of the $350,000 in prize money. Riders also have a chance at winning the $350,000 Rolex Grand Slam of Eventing, which is awarded to any rider who wins the Rolex Kentucky, Mitsubishi Motors Badminton and Land Rover Burghley Four-Star Events in succession. Ticket sales for 2016 Rolex Kentucky Three-Day Event opened in November and have maintained a record-breaking pace. Grounds Admission tickets to RK3DE include parking, admission to the grounds, International Trade Fair as well as all the Kentucky Horse Park has to offer. RK3DE Grounds Admission for children 12 and under is free. To watch the competition in the Rolex Stadium, a reserved stadium seat in addition to the Grounds Admission ticket needs to be purchased. Stadium seats for Sunday’s Show Jumping are sold out but tailgating is available where fans can watch all the Show Jumping action on Jumbotrons. Only a Grounds Admission ticket is required for Saturday’s Cross-Country phase of the competition; a few Saturday tailgating spaces are also still available. Tickets are available at www.RK3DE.org/tickets. For more information, or to purchase tickets to the 2016 Rolex Kentucky Three-Day Event Presented by Land Rover, please visit the Rolex Kentucky website at www.RK3DE.org, or call (859) 254-8123. 2010 World Equestrian Games – 5 Years Later! This weekend marks the 5th anniversary of the closing of the 2010 World Equestrian Games, or what we of course more affectionately call the Kentucky World Equestrian Games. Its even crazier to think that this December will mark 10 years since the announcement of us winning the bid to host the Games in the first place. Early this year I really believed we would be working on hosting the 2018 Games at this point but that wasn’t meant to be but that has created impetuous for us to land the 2022 Games, though that push is on hold until after the November elections when we know who our next Governor will be. The last memory I have of the Games on this weekend 5 years ago was being part of the Closing Ceremonies and Lyle Lovett signing our credentials, which are hanging on the wall beside me as I type this. I am not a Lyle Lovett groupy but it was a nice closing note on an amazing event in my life that made for a perfect memory of the Games. Of course I still believe I will get to make new memories of another World Equestrian Games and maybe even Lyle will make those games as well. The 2018 World Equestrian Games in Bromont are less then 38 months away and preparations are well under way. COJEM2018 (Comité Organisateur des Jeux Équestres Mondiaux) is the organizing committee NPO of the 2018 Games which has already been at work for more then 6 months to get the ball rolling after the tough but successful Games last year in Normandy France. Now coming to what many consider the France of the West, for only the second time outside of Europe adds a level of pressure to be as successful as Lexington was in hosting the 2010 Games. One of the early decisions on logistics that I applauded was the decision to exclude all none event required vehicles from the venue grounds and shuttling all spectators and non-essential staff from staging areas around the city. This is one of the ideas I am pushing for Lexington’s next bid for the Games because traffic logistics is always the largest headache with these kind of events because of how it can strangulate the overall logistics as well as being a security night mare. In order to provide the best experience for the participants, the Teams will be allowed to drive into the venues and all efforts are being made to provide them accommodations within a 30 minute drive of the their venues. Most spectators are expected to seek accommodations in Montreal and public transportation will be setup to get them from their hotels to the venues. I will continue to compile more of the information I am getting and provide further updates. For those interested in volunteering you can sign up at this link.